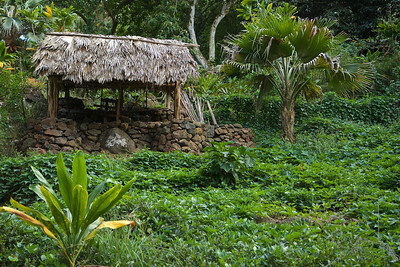 Heiau (temple) dedicated to Lono, deity of agriculture and fertility, peace and music. To Native Hawaiians, Lono descended to Ao (Earth) on a Anuenue (rainbow) to marry Laka, one of Pele's sisters and guardian of the woodland. In agricultural and planting traditions, Lono is identified with rain and food plants. He is one of the four gods (with Ku, Kane, and his twin brother Kanaloa) who existed before the world was created. Lono is also the god of peace. In his honor, the great annual festival of the Makahiki (four month festival starting in October) was held. 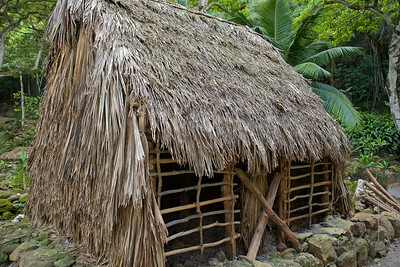 During this period (from October through February), all unnecessary work and war was kapu (forbidden). The last known hale o Lono belonged to Prince Alexander Liholiho (Kamehameha IV) and was located in the area known today as Fort Street Mall in Downtown Honolulu. 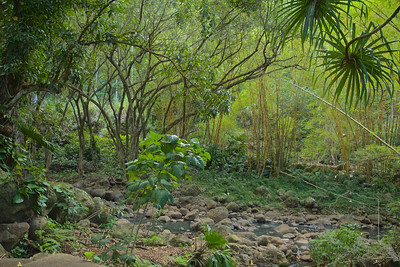 Hale o Lono located in the ahupua`a (land section) of Waimea Valley dates back to 1470AD, and is the only fully restored Hale o Lono in the State. 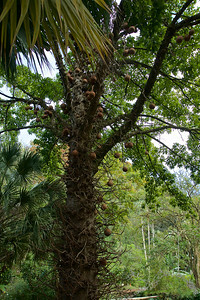 Couroupita guianensis, known by several common names, including cannonball tree, is a deciduous tree in the family Lecythidaceae, which also contains the Brazil nut. 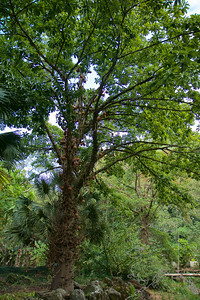 Couroupita guianensis grows up to 35 m in height. 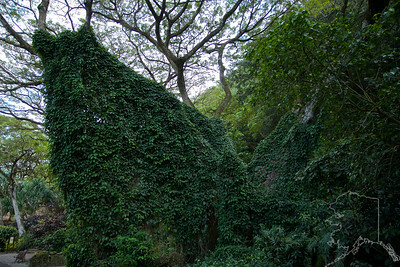 The clustered leaves vary in length, generally from 8 to 31 centimeters, but reaching up to 57. 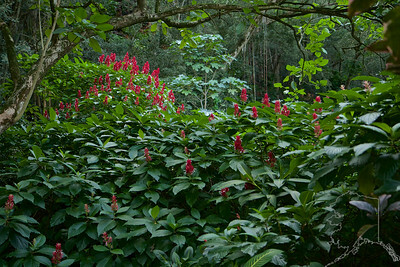 The flowers are born in large bunches up to 80 m long. Some trees flower profusely, until the entire trunk is buried in flowers. 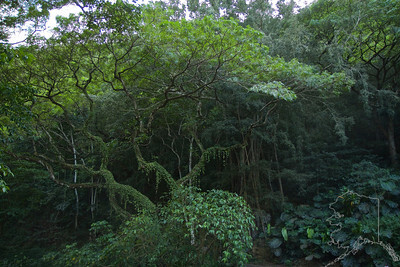 One tree can bear 1000 flowers per day. They are strongly scented, especially at night, and in the early morning. They are large, up to 6 centimeters wide, and often brightly colored, the six petals in shades of pink and red near the bases and yellowish toward the tips. There is a ring of stamens at the center, and an arrangement to stamens that have been modified into a hood. The large fruit, which is woody and very spherical, measuring up to 25 centimeters wide, gives the species the common name "cannonball tree". A smaller fruit contains perhaps 65 seeds, while a large one can have 550. One tree can bear 150 fruits. The fruit takes up to a year to mature in most areas, sometimes as long as 18 months. 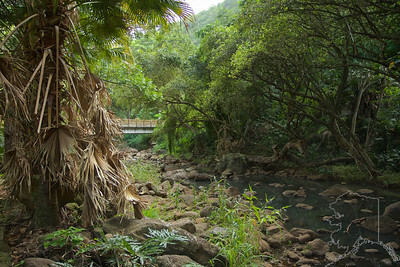 The ahupuaa of Waimea, known for its picturesque bluffs, its permanently flowing river and its deep bay, provided many resources for its inhabitants and was the setting for many important episodes of Oahu's history. 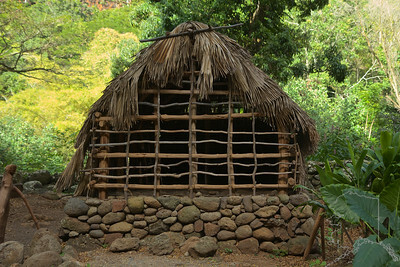 Perhaps most important, however, are its priestly associations, which marked Waimea as a sacred place for more than 700 years of Native Hawaiian history. 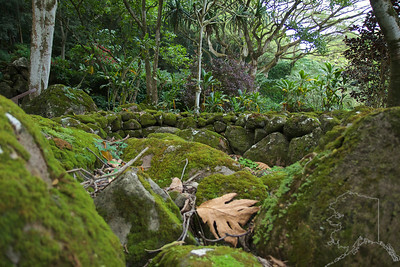 Waimea, "The Valley of the Priests," gained its title around 1090, when the ruler of Oahu, Kamapuaa (who would later be elevated in legend to demigod status as the familiar pig deity) awarded the land to the high priest Lono-a-wohi. 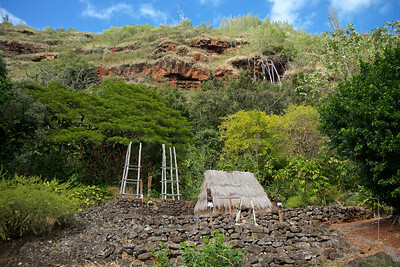 From that time until Western contact and the overturn of the indigenous Hawaiian religion, the land belonged to the kahuna nui (high priests) of the Paao line. 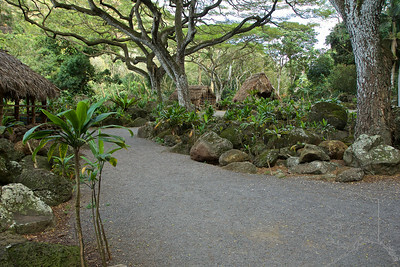 Throughout Waimea Valley we also saw many cultural sites, such as the Pa Holoholona (Animal Pens), Pohaku `Aumakua (Guardian Spirit Rock), and Ku`ula Stones (Fishing Shrine). 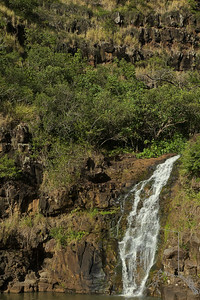 Waimea Falls is a very popular and scenic waterfall nestled in the North Shore of O'ahu behind Waimea Bay. 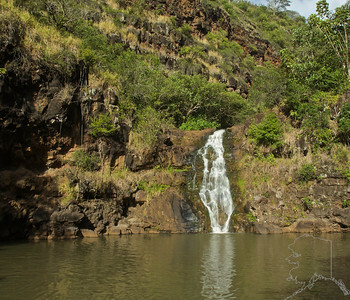 The waterfall spills 45-55ft. 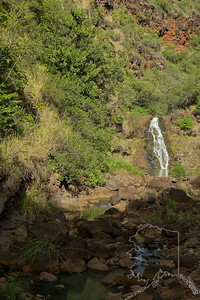 Waimea Falls has many names. "Waimea" means "reddish water" in Hawaiian, which is a reference to the underlying reddish volcanic soil. During times of heavy rain, the swollen Kamananui Stream scours the reddish volcanic soil from the stream banks and colors the falls red. 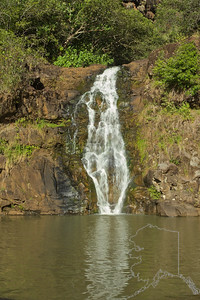 Waimea Falls is also known as Waihi Falls. 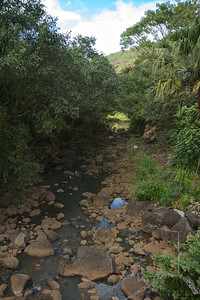 Waihi means "trickling water" or "clinging water."